Holiday Party Survey: Companies Plan to Spend More This Year | Challenger, Gray & Christmas, Inc.
With a stable economy and corporate profits on the rise, a new survey shows that not only are companies planning holiday parties this year, but many also expect to increase spending on these soirees. In its annual survey on holiday party plans, global outplacement consultancy Challenger, Gray & Christmas, Inc. found that 80 percent of companies are planning to host holiday parties this year. Of these, just over 21 percent are budgeting more for their events. “After dipping in the last of half 2015, corporate profits are back above $1.6 trillion, according to government data. Our survey suggests that employers are ready to spend some of those profits on their workers,” said John A. Challenger, chief executive officer of Challenger, Gray & Christmas. The Challenger survey was conducted in October among a small sampling of approximately 100 human resources executives, representing a variety of industries across the country. More than 66 percent of survey respondents said their companies are hiring caterers or event planners, up from 62 percent last year. Companies are also allowing more guests at their parties: 42.9 percent will include spouses or family to attend, up from 31 percent in 2015. “Company holiday parties are a great way for employers to thank workers for a successful year. For employees, it’s a great way to meet and interact with co-workers and managers who are not part of one’s daily routine. If you happen to be attending the holiday party of a spouse or friend, it could be a great opportunity to network,” suggested Challenger. “In addition to the benefits, however, holiday parties can be fraught with risks, for both employers, employees, and guests. The biggest risk, of course, is related to alcohol consumption,” cautioned Challenger. In fact, almost 62 percent of respondents to the Challenger survey said their holiday parties would include alcohol. That is up from the 54 percent that reported they would serve alcohol in 2015. “Serving alcohol can make for a more celebratory mood, but it also has pitfalls, especially for employees and their guests. Company parties are not necessarily a time to let loose,” warned Challenger. In the Challenger survey, 20 percent of respondents said that their companies would not be having a party this year, 16 percent of which indicated they never hold parties. 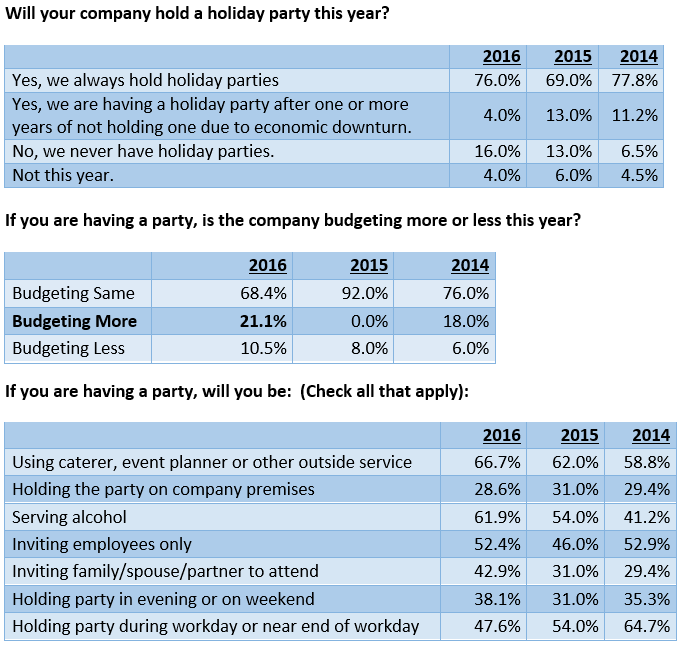 The percentage of companies not having parties is on par with the percentage of companies not having parties a year ago. More than one-third (38 percent) said their parties will be held on a weekend or evening, up from 31 percent last year. This might be your best opportunity to talk with senior executives while things are still relatively quiet. It is easy to simply socialize with the members of your department, with whom you work with day in and day out. However, you gain if you use this occasion to meet people in other departments. You never know who can help your career. Free alcohol can quickly lead to excessive drinking. Stay in control. You do not want to do anything embarrassing to you or your employer. Even if your alcohol-induced actions do not get you fired, they could hurt your chances for advancement. The company party is not the place to try out your latest pick-up lines. The risk of such behavior being seen as sexual harassment is high. This is not the time to approach your boss with a new business idea. Save that for Monday morning. Instead, find out about his or her interests outside of the office. Find a connection on a personal level. That connection will help you on Monday when you bring up the new idea and it could help when it comes time for salary reviews. 52 percent of company parties are employees only. If a friend invites you to his or her company party, you should go. It is an opportunity to expand your professional network, which is critical in this era of downsizing and job switching.